Black Dog Publishing is offering a 40% holiday discount on eight of their craft titles. The offer expires December 31, 2010. Black Dog Publishing specializes in beautifully illustrated books that represent a fresh, eclectic take on contemporary culture. The titles featured in this offer include the recently released Outside the Box: Cardboard Design Now - a detailed look into this versatile material, and how cardboard is used in a creative, artistic and practical way in contemporary design and everyday life, ­ as well as popular 2010 releases In the Loop: Knitting Now and Printmaking: A Contemporary Perspective. 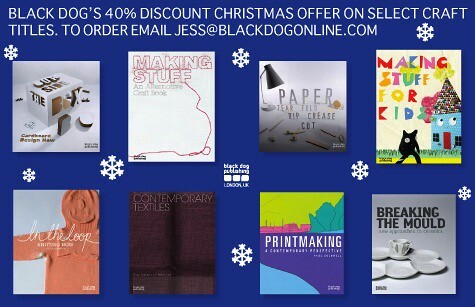 To take advantage of the 40% discount, simply email Jessica Adkins at jess@blackdogonline.com with the title(s) of interest & your delivery address to place the order.